Last Saturday was almost a brilliant day. Halfway through the National Cyclocross Championships in Shrewsbury, I was in 6th place and looking good to podium in the 45-49 cat, to match my bronze medal in the 40-49 cat from 2013. The conditions were pretty epic with more running required than usual, which initially played to my advantage. I had just about timed my season well and the strength was there. But it wasn't to be, my legs, once half decent at running, could no longer take these exertions. On one of the uphill scrabbles while off the bike and running, I first pull my calf, quickly followed by my hamstring. 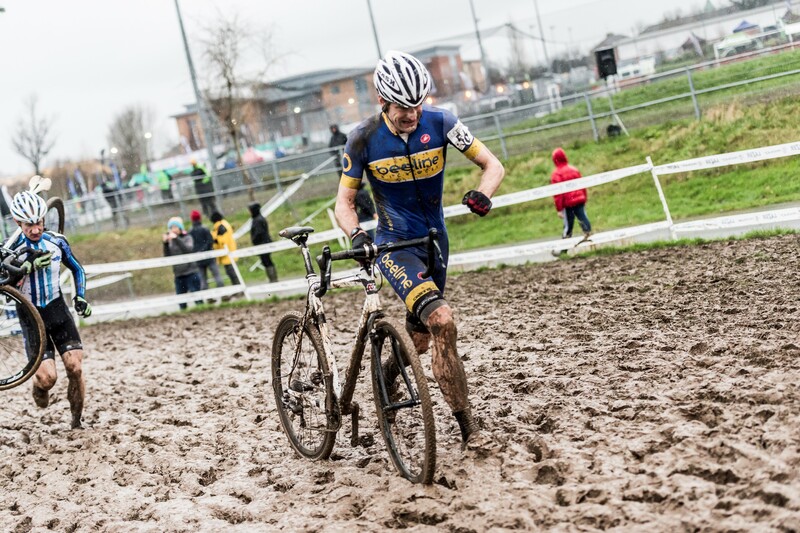 Actually one of the many things I love about cyclocross is having to quickly adapt, think and manage the situation. I could now no longer shoulder the bike when running and needed to use it to lean on as I pushed it through the mud, to ease the strain on my leg. It's hurting a lot and could be doing some real damage, but I know the pain of a DNF is far greater. I have at least 20 minutes to get to the finish and am now forced to ride when it would be quicker to run, I’m one leg down! To add to the situation I puncture on the last lap. The problem has cost me places and I finish 12th. Salvaged something but a missed chance of fine result. A younger me would have been really upset with this, have sleepless nights and would literally have to beat myself up in training to vent the disappointment. It's happened many times, no matter how many good results you get, the anguish of a poor one would dominate your mind. Sport is sometimes cruel, your high hopes and dreams can evaporate in an instant. Years back, I used to write song lyrics, one was called 'Craving Scarred Nostalgia’. Reading it now is frightening, I was clearly in a dark place. There was no anger there, I just didn't seem to like myself very much. 'Happiness is Easy', it's just another song title, and at a party in High Wycombe in my younger days, is what I wrote in the condensation on the window, in a drunken depressed state. Was I just trying to be cool, or was it actually a simple cry for help? When you're somehow unhappy despite great friends, family, stable job and a healthy sporting ability, then that depression goes unnoticed by all but you. You can't possibly ask for help as you should have nothing whatsoever to be unhappy about. Nobody realised I was in a hole. It wasn't an overnight fix, my dark times haunted me for a while. I worked it all out by myself, maybe asking for help might have speeded the process up, but back then it was impossible to talk about, even now it's difficult to confess. I found solace in the lyrics of Ian Curtis, odd really due to the total lack of hope contained within them. Ambition tends to make you somewhat selfish, you strive for 100% on everything, and when you don't achieve it you can very quickly spiral down, I see that now. Through the years I've realised you should never hunt fame, only achievement and be aware of the difference between the two. So I no longer worry when things don't quite work out, see the positives, they are everywhere. So I leave a wet, muddy Shrewsbury park, load up the van and get on the motorway, my calf and hamstring are cramping and burning, I’ll be limping for a few days. On the plus side racing on that course, in those conditions was fantastic, bravo to the organising team. There’s nothing quite like skidding sideways around a corner in the mud without braking. Hopefully I can finish the last couple of races this season, who knows? I'm not turning my back on sport just yet, there's always an adventure to be had, but priorities have changed slightly. I get home just in time to put my daughter to bed, it's clear that my true happiness seems to stem from the fact that the future is now no longer me.....the future is her and now actually every day is a brilliant day.